Ben Harris is a specialist in the design and construction of natural water features, based in the eastern suburbs of Melbourne, Australia. Ben Harris Gardens recently won the “Rising Star” award at the Landscaping Victoria 2017 Industry Awards. ‘Calming waters’ won first prize in the Boutique garden section in the Melbourne International Flower and Garden show 2016. Read more about it here. Ben has been working in the landscape industry since the mid-2000s. Much of his initial experience was gained working with leading landscaper Martin Hopkins, constructing and planting out formal and semi-formal gardens throughout the inner suburbs of Melbourne and at Macedon, many of which were the work of renowned Australian garden designer, Paul Bangay. In this environment he became accustomed to working to the exacting standards required for the formal garden style. While he is equally at home constructing formal and informal gardens, since starting his own business he has focused on designing and constructing more natural, free-flowing gardens. He works to the same level of detail to position a rock in just the right place, or to move plants that have dared to appear too symmetrical. Ben has a special talent in working with natural elements like rocks and water. Whilst anyone can build a pond or stream, not many can make them look natural. Ben, however, has an instinctive, artistic eye for knowing how to place rocks and plants and how to carve a stream or pond in the landscape so that it blends seamlessly with the existing garden. He has been inspired by the Japanese masters of centuries before, contemporary Australian landscape designers, and of course, nature itself. It is true that rocks ‘speak’ to you. Sometimes a rock feels right, and sometimes it just feels wrong. We take the time to listen to each rock, and the results show that. 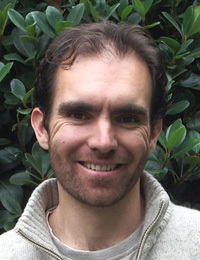 Ben holds an Associate Degree in Environmental Horticulture from Burnley College (University of Melbourne) . While studying, he honed his landscaping skills at night school and completed a Certificate III in Landscaping at NMIT (now Melbourne Polytechnic) – graduating with an award for the best adult trade student. Ben is a proud member of Landscaping Victoria. All members of Landscaping Victoria work to the highest professional standard. He is also a Certified Aquascape Contractor (CAC). CACs are the most qualified and informed pond installers in the water gardening industry. As a CAC, Ben uses only high grade materials and equipment sourced from industry leaders Aquascape Supplies. For more information please visit the Aquascape Supplies Australia website. We design and build natural water features inspired by the beauty of nature. Ben Harris Gardens © 2019. All Rights Reserved.